First of all, I must apologise for those delayed diaries, unlike last year when I managed to write daily. Issue with the internet at the flat I stayed at on first few days then lack of time meant I just gave up trying to catch up and kept them for my return, which feels a bit retro, like before the internet when we had to wait for the June issue of film magazines to hear about Cannes. At least I shall have a bit of hindsight, even if some of my memories might be a little muddled up already. 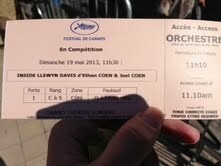 And SPOILERS, I can already tell you that this has been the most exciting Cannes film festival I have ever attended! I was actually a bit nervous before heading to Cannes this time. I went back last year after a 15 years hiatus with zero expectations, not even knowing if I'd manage to see a film, and it exceeded my expectations, also seeing two of my favourite films of last year in the process (Holy Motors and Post Temebras Lux). So the stakes were higher this time. And early signs were worrying. I arrived at the festival a bit later on the first Saturday night, purposefully avoiding the always busy first few days, and there were mentions on Twitter of how busy this year felt and how the attendance had shot up, which was not good news for people like myself at the bottom of the food chain. And the weather was said to be atrocious. At least this year I stayed in Cannes proper, sharing a flat with two other film bloggers near the Palais. 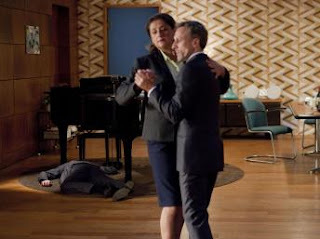 So on my day one, on a glorious sunny day, I went to the Cinephiles centre, with a knot in my stomach when I saw that they did not have any invitations for the midnight screening of The Blind Detective that day, even though those midnight screenings were the easiest to get to for us, Cinephile badge holders. Panic ensued. Undeterred, I placed myself outside the palais two hours before the 11am screening of Inside Llewyn Davis by the Coen brothers, with my little sign asking for an invitation, and lady luck smiled at me right away, within 2 minutes, a man handed me a spare invitation (the reason people give away spare invitations is because if they do not use all the ones they get allocated, they get penalised and receive less of them as they get scanned upon entrance)! It was all the more remarkable as I heard how the press screening of the day before was so oversubscribed that some had waited for three hours and still did not get in! Just to clarify, just like last year, unlike other film festivals, Cannes did not give me a proper press accreditation, only a Cinephile one, which is reserved for more casual film bloggers like myself. But the irony is, as I realised, it ended up being sometimes easier for me to see the films of the official selection than for some journalists, who really suffered with oversubscribed screenings this year, whereas I managed really well attending the screenings for professionals, scoring invitations for everything I wanted to see. (Cannes is not open to the public, you cannot buy tickets, you need an accreditation AND an invitation). I could already see that rumours of the increased attendance were true however, as a sizeable queue to get in had already formed 90 minutes before the start, which I had to join (the invitations are free but the festival delivers more than they are seats, so there is no guarantee of getting in even with one). And it was with a certain trepidation that I got into the massive screen that is the Theatre Lumiere, which also gives me some goosebumps whenever I go back in for the first time on each festival, with old memories flooding back. 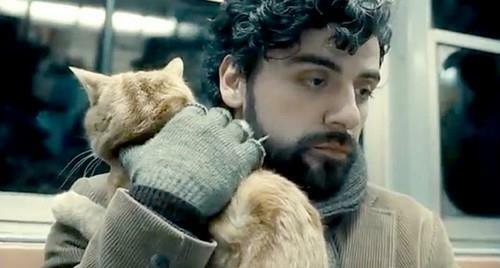 So Inside Llewyn Davis. The Coen brothers have always been very unpredictable and, to me, wildly uneven, so there was no telling how this would turn out. In their new film, Oscar Isaacs plays Llewyn Davis, a fictional folk singer in New York in the early 60's, down on its luck despite a visible talent, having to sleep on friends' couch whenever he can, chasing that impossible success or even recording contract. What started off as a seemingly amusing if slight film turned out to be one of the directors' best. Their lovely recreation of the New York of the era is immediately engrossing, and their depiction of the plight of a struggling artist is full of subtleties and warmth. There is quite a bit of dark humour to be found in the singer's misery, but he really is never quite far from tragedy, being basically homeless and not even having a proper coat to get him through the bitterly cold winter. 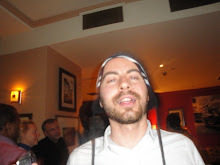 But the directors do not make him a martyr either, in fact, he is more often than not his worst enemy, coming across as fairly likeable but also completely irresponsible, often antagonising the very people who mean to help him. And Oscar Isaacs, whom I had only every seen in that turd W.E., delivers a wonderful and restrained performance as the tortured singer. While the rest of the cast does not have much screen time even though some still have quite a bit of an impact (especially Carey Mulligan, and John Goodman in a hilarious cameo), cat lovers will LOVE the cat in this, who should have got second billing in the credits. I will not spoil too much of the story but he is at the heart of a recurring gag throughout the film, and I cannot believe of the gifted directors managed to get it to "act" so well. He elicited some of the biggest laughs in the audience, and I could almost hear the collective awww at every one of his appearance. There were actually calls of a change of rules in the coveted Palme Dog to allow a feline to take the prize. Inside Llewyn Davis is a warm and engaging film with a sad undertone, which felt like being given a hug by a bearded man with a warm jumper in a smokey speakeasy. And do not worry if you do not have the slightest interest in folk music as I do, it will make zero difference in the enjoyment. You already know the film got a prize but I shall discuss the prizes on my final post. And just to add that touch of glamour, as I left the screening, Nicole Kidman walked right past me with her bodyguard, which left me stunned for a few seconds! Members of the jury have to see all the films of the competition, obviously, and they are often found in daytime screenings, sitting in their lodge at the back. She was very tall, very glamorous and very white! The next film of the day was Borgman, however I was worried that the short turnaround between films would make it near impossible to watch them back to back. And with zero expectations, I walked back to the front of a Palais with a sign asking for an invitation for this film, only to be given one literally within seconds by a kind woman, who I started a conversation with in the queue. She turned out to be an actress/stuntwoman called Anne Barrandon which has quite a few credits mostly in French TV (you can check her on IMDB), and she left me her card, which I thought was quite sweet. This is one of the aspects I love in Cannes. Unlike, say, the London Film Festival where I would not dream of talking to strangers, here because everybody is from out of town and because there is a shared sense of purpose and community (and also because of the horrendous queues! ), everybody talk to everybody else in the queues, which really brightened up my festival, as I loved the variety of people I got to talk to. I also love the way everybody is always very happy to help you in any way they can, and my attitude at the festival, for somebody with barely any credentials, was to expect nothing and be graceful and smiling, which turned out to be a winning one. So on to Borgman. His Dutch director, Alex Van Warmerdam, became a mini arthouse sensation in France in the mid 90's, thanks to a couple of films called The Northeners and The Dress, with his blend of deadpan black humour and Ikea surrealism, before vanishing into obscurity. So his return, and on the official selection no less, was great news. But the great news did not last. In it, a homeless man who lived in some underground cave finds himself gaining access to the house of an upper middle class family, thanks to a bored housewife, most probably subjected to domestic abuse, and her mix of guilt and thrill seeking. Once part of the house, he unleashes his mysterious and nefarious plan. The Ikea surrealism and dark humour are still present, but the latter is pushed too far. Some have mentioned Theorem and Funny Games for the similarities in the stories (and a pair of murderous women reminded me of Baise Moi) but the film feels completely unfocused, and mean-spirited without actually having much to say, apart from a clumsy and unoriginal attack on upper middle class hypocrisy. There are a couple of inspired scenes and some interesting visual jokes, but the extreme cynicism brings it down completely. Even such perceived nihilist directors as Gaspar Noe find a way of infusing their film with humanity, even if it is not always obvious, but here, nothing. One to forget. Sadly, despite getting there 95 minutes before the start, and having to queue a further 30 minutes as the film was delayed, we did not get in! Which basically confirmed what I already knew from last year, that ironically it was to be easier to see the films of the official selection in the Palais than any others. It was not a total waste of time however, as I got chatting with a lovely woman in the queue, not at all in the industry as she worked in a sport shop, but who had been attending the festival for 15 years without fail, and we had a wonderful conversation for the whole 2 hours! And after dinner, an innocent tweet I sent asking for an invitation for the Miike film the next day proved successful as one of my Twitter contacts offered me one for the 830am press screening the next day, which was thrilling (the required 630am wake-up call slightly less thrilling however).